Claassen’s Flour Mills on East Sixth Street, Newton – 1960s photo. Operation dates: 1906 – early 1960s. With the 1904 move by Eagle Milling to its new facility on East Broadway, the East Sixth property became available. By April of 1905, the mill on East Sixth had been purchased and by the end of May, Peter M. Claassen had sold the Alta mill property (originally known as “Claassen’s Mill”) since he had decided to operate a flour mill in Newton in the “old Eagle Mill building” per a newspaper article. Peter Claassen learned the miller trade by working in the Burrton mill and in Warkentin’s Halstead mill. Claassen purchased the Alta mill in 1884 and operated it until the floods of 1903 and 1904. Not wanting to repeat those harrowing experiences, Claassen sold the Alta mill and moved his family to Newton where he owned and operated the Claassen’s Flour Mill on East Sixth Street. 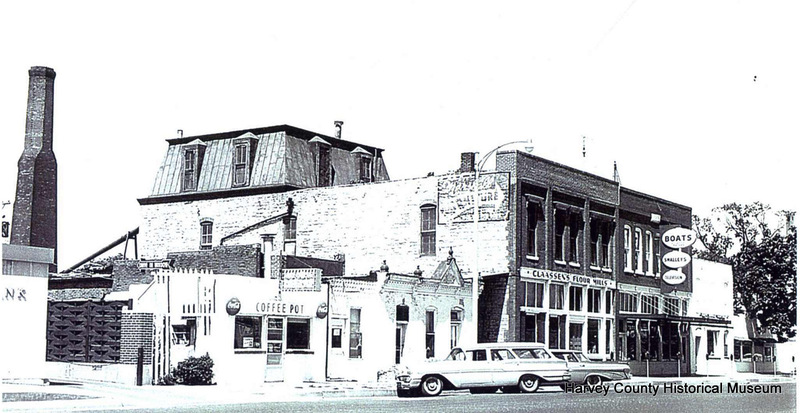 The 1960s photo shows the Coffee Pot Restaurant, Sanner Seed and Feed, Claassen’s Roller Mill, Old Newton Carriage Factory Building and the Newton Creamery building at the far right. Location: north side of East 6th Street in Newton. Photo Source: HCHM Collection.